For a strong competitor in the French Bulldog Best of Breed; quality breed type, condition and expert presentation are necessary. Any mistakes in the presentation, problems with training, conditioning or any grooming or appearance errors are simply not going to be overlooked in this class. The Best of Breed is a Masters class that consists of French Bulldogs that are certified to have more than adequate merit and quality. Leading back to our original question: What is the secret for success in show? 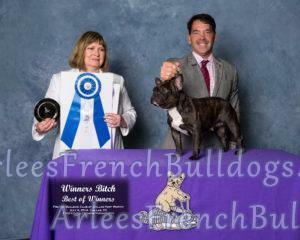 The first order of business before stepping foot into a competitive Best of Breed arena is to obtain an objective, unbiased assessment of the dog’s potential from a qualified judge of French Bulldogs. Having expert resources at your disposal such as experienced mentors and handlers is proven to be invaluable to your dog’s success. They can help you set realistic goals based on the conditions that will be required to succeed in this category and then move forward to achieving those goals. The most important elements of a Grand Champion can be seen in an above-average breed type along with the stamina, mental & emotional stability and general attention craving personality of an all-star dog. Grand Champions must also have a high tolerance for consistent grooming, crating and traveling. Surviving on the road and partnering well with a human handler is of the utmost importance. 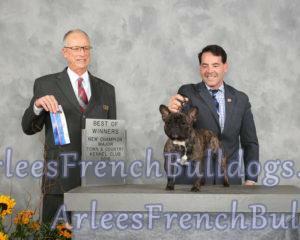 These qualities are often untested in a class dog’s exposure to showing, but most young above-average French Bulldogs can move quickly and achieve their champion titles quickly, much like my male Grand Champion French Bulldog pictured above who achieved the rank of Grand Champion in only 6 months. Putting together a winning show campaign requires not only expertise, but experience to make the appropriate decisions based on the dog’s well being. Starting a show campaign with a young Special demands multiple qualified opinions. It is proven time and again that success in show is based strongly on the fundamental basics and the strength of the dog’s winning components. None of these things would make a difference, however, unless your French Bulldog expresses pure perseverance and unwavering tenacity. 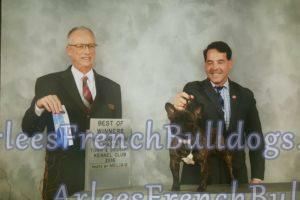 *The above photos are of my male French Bulldog who was able to achieve the title of Grand Champion from start to finish in only 6 months. 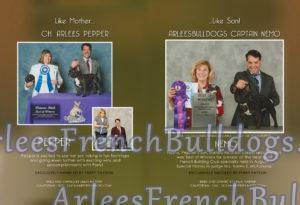 He is our pride and joy and his legacy will live on through his puppies here at Arlee’s French Bulldogs.